I recently came across an article in Forbes about how Fannie Mae is transforming its data environment to emulate more of what we see at firms like Amazon, Apple, Google and Facebook. Fannie Mae brought in Scott Richardson, formerly of Capital One, to assist with this transformation. Scott has a long history of leading-edge data modernization efforts which includes playing an instrumental role in creating Capital One’s first data warehouse, as well as assisting with its overall data transformation, enabling Capital One to become the data-driven financial services firm that it is today. 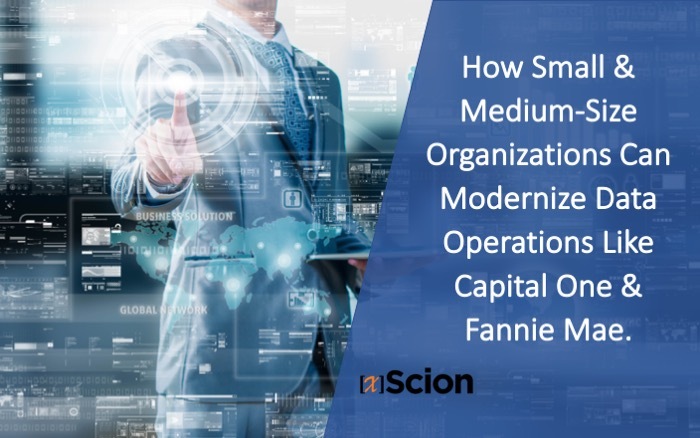 What really struck me about what Scott and his team did at Capital One - and what they are now doing at Fannie Mae - is that even though these are two very large, enterprise organizations, the methodologies behind their transformations can and should be applied to any size organization looking to modernize their data environments. I pulled the following points directly from the Forbes article, and I’ve included an explanation on how each one can be applied to even the smallest of organizations. The point being, the “Capital One way” and the “Fannie Mae way,” aren’t just reserved for the biggest and most wealthy organizations in the world. These methodologies are the same that we advocate as part of our Agile Data Maturity Model (or ADMM as we call it) and should be applied to any organization looking to modernize their data environments. Like most longstanding corporations, Fannie Mae has legacy environments characterized by data silos. This circumstance makes it challenging and expensive to access high quality data in a timely manner. By and large, siloed data is a challenge that affects just about every organization, regardless of size. At many of the small to medium-size organizations that we work with, we often see this problem result in the unwelcomed but necessary implementation of very manual and costly workarounds. As an example, you may have several people manually pouring through various data sets to fix errors, clean things up and eventually structure that data in a way where its actually of use to the end-user. The goal of this effort would be to establish a centralized data function where they could manage data to a high-level of quality, consistency and timeliness across the enterprise. “The right data, with the right quality, at the right time”, as Richardson says in the article. At a minimum, all organizations should strive to have the right data, with the right quality, at the right time. If you could create that type of environment at your organization, what would the result be? How much time and money would be saved? How much better and more actionable would your decision-making be? Business adoption is the key to success. At small and medium-size organizations, a common complaint is that data modernization has been left to the IT department. While technology certainly plays a huge role in data modernization, data should be owned and managed by the business and supported by IT. For firms that undertake ambitious data transformation initiatives, there is a common recognition that changing behaviors in a legacy culture requires time and patience. The process should be thought of as a journey. Terms like data modernization, data transformation and even data governance, are all big terms that are often misunderstood and often elicit stress and confusion. These terms can be particularly alarming in a smaller or medium size organization, especially when it comes to people and culture. At some organizations, you may have people who have been there for fifteen or twenty years, or even longer. Making changes to how data is handled is likely to be met with skepticism and resistance. The reality is, data modernization isn’t a project or initiative, or even some new set of rules that are intended to be forced on people. It’s really a new way of thinking and as the Forbes article indicates (and as we espouse in our ADMM) it really is a journey. And with any journey, you need to take the first step and map out future steps. Every organization is unique and as such, every data modernization journey will be unique as well. Companies that are successful focus on quick wins and demonstrate incremental progress. Like the point above, you don’t have to fix every data problem all at once. For small and medium-size companies that have limited budgets, it’s imperative to show ROI as early as possible. With that in mind, you need to be aware of where your biggest data gaps are and where you can have the most immediate impact with any initial investment. Getting off to a bad start with data modernization at a smaller organization can derail the effort for months or even years, so it’s extremely important to get this part of the journey right. Additionally, it’s critical that you have your organization’s unique roadmap laid out, to ensure consistent and incremental wins as the journey progresses. One of the innovations that Fannie Mae instituted was to establish a community of Business Data Officers, to ensure that data is fully owned and cared for by business leaders. For small and medium-size organizations, it is rare to find one person whose only job is managing data modernization. More often than not, this falls on the shoulders of several people, and as I mentioned earlier, IT is often the department where this responsibility is bestowed. One of the most important things any organization can do as a first step in the data modernization journey, and one that we advocate in our ADMM, is the identification of stakeholders from across the organization (business, IT, operations, etc.) and eventually the formation of a what we call a data governance council. Data is now viewed as a business asset. This is a phrase that is often thrown around and commonly mentioned in meetings and conversations. But the reality is, even if you’re a small or medium-size organization and even if you’re a nonprofit or association, you may “realize” that data is an asset, but you probably aren’t treating it as such. For traditional assets like an organization’s investments, capital and even people, these things are cared for and fostered. That often isn’t the case for smaller organizations or nonprofits. For some of our clients, they sometimes first need help in making the businesses case for data modernization, before leadership will agree to make any kind of investment. This can be a challenge when budgets are tight and there’s usually a strong aversion to risk. The very last line of the Forbes article states, “Iteration and learning fast – this is what it means to compete on data and analytics in the competitive Era of Big Data.” I think we all realize that we are in fact in a new era and as it often the case, the biggest and most wealthy companies tend to lead the technology adoption curve. The rest of us can learn from these organizations and when it comes to data modernization, we can and should be using many of the same strategies and methodologies being employed by these larger organizations. Whether it is getting your data out of its silos, ensuring your data is clean and accurate, formulating what your data journey might look like, planning for quick wins and quick ROI or making data modernization a priority that’s shared by everyone, your organization, regardless of size, type or market focus, can modernize just like Capital One, Fannie Mae or any other larger organization, and we can show you how.